SPIFFY, founded in 2002, is a broad, countywide coalition that helps local communities reduce risk factors that make it more likely youth will engage in unhealthy behaviors, while increasing protective factors that encourage youth to make healthy choices. This approach collects and uses data to identify strategies, policies and evidence-based programs that reduce unhealthy behaviors. SPIFFY is administered by the Collaborative for Educational Services. Working with schools to implement evidence-based prevention programs targeting youth violence, bullying and substance abuse. Research shows that creating a culture in our community in which unhealthy behavior is not acceptable is the best deterrent for youth. With this in mind, SPIFFY helps communities throughout Hampshire County develop environmental strategies to prevent these problems and promote healthy decision-making. The coalition has expanded their focus to address the growing problem of obesity and chronic disease that is impacting health of our communities. For the past five years, SPIFFY has worked with schools to survey 8th, 10th and 11th graders across the county to assess risk and protective factors for substance abuse, bullying, and other behaviors that put teens at risk for a variety of problems in school and life. Surveyed hundreds of Easthampton parents for a social norms marketing campaign to illustrate the positive attitudes and choices parents are making to prevent drug & alcohol use among teens. 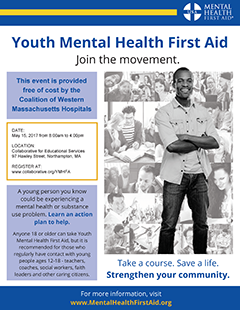 Hosted trainings on: adolescent brain development and addiction; bullying and school climate; and using prevention curriculum in the schools. Sponsored server trainings for 80 bar, restaurant, and package store employees. Hosted a “Meet & Greet” community forum to bring together Easthampton parents, local leaders, educators, youth, police, businesses, and faith communities. Organized and facilitated local task forces focused on youth substance abuse prevention.